Recommended to screen hyper-reactive tonsils to find those with highest expression of PD-L1 in crypt epithelium, macrophages homing the germinal centers and interfollicular mononuclear leukocytes. PD-L1 expression varies by tumor type so screening is recommended to find positive and negative tumor controls. Note: Look for specimens with high numbers of inflammatory macrophages and mononuclear leukocytes. Negative controls: COLO205, see ab95356. Primary negative control, isotype control: RabMAb negative control antibody, ab172730. Recombinant protein: Recombinant human PD-L1 protein, ab167713. For recommended Western Blotting (WB) protocol, Flow Cytometry (FC) protocol and Immunohistochemistry (IHC) protocol, please refer to the protocol section, here. For IHC usage on FFPE tissues, we recommend using PD-L1 IHC panel ab236676, which contains PD-L1 clone 28-8, Universal HIER antigen retrieval reagent (ab208572) and IHC detection kit HRP/DAB (ab209101). For clone 28-8, it is recommended to use Odyssey system. This system has the advantages of a wider dynamic range and less background than chemiluminescence. Conjugated versions of the antibody available (Alexa Fluor® 488, Alexa Fluor® 647, PE, HRP) - see list. A low endotoxin, azide free version of the antibody is available: ab209889. Anti-PD-L1 antibody [28-8] has been used as detector antibody in Human PD-L1 SimpleStep ELISA® kit: ab214565. Our Abpromise guarantee covers the use of ab205921 in the following tested applications. Please refer to protocol section here. For antigen buffer for FFPE tissue, it is recommended to use Universal HIER antigen retrieval reagent (ab208572). WB Use at an assay dependent concentration. Predicted molecular weight: 33 kDa. ICC/IF Use a concentration of 2 µg/ml. Involved in the costimulatory signal, essential for T-cell proliferation and production of IL10 and IFNG, in an IL2-dependent and a PDCD1-independent manner. Interaction with PDCD1 inhibits T-cell proliferation and cytokine production. Highly expressed in the heart, skeletal muscle, placenta and lung. Weakly expressed in the thymus, spleen, kidney and liver. Expressed on activated T- and B-cells, dendritic cells, keratinocytes and monocytes. Cell membrane and Endomembrane system. 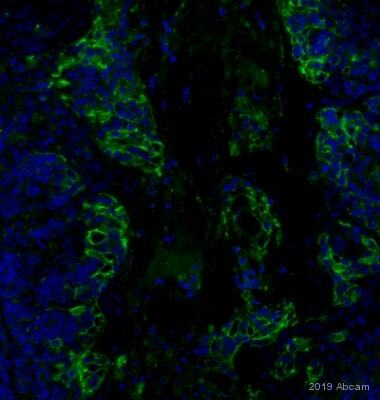 IHC image of ab205921 staining PD-L1 in human tonsil formalin fixed paraffin embedded tissue sections*, performed on a Leica BOND RX (Polymer Refine kit). The section was pre-treated using heat mediated antigen retrieval with EDTA buffer (pH9, epitope retrieval solution 2) for 30 mins at 98°C. The section was then incubated with ab205921, 5μg/ml working concentration, for 60 mins at room temperature and detected using an HRP conjugated compact polymer system for 8 minutes at room temperature. DAB was used as the chromogen for 10 minutes at room temperature. The section was then counterstained with hematoxylin, blued, dehydrated, cleared and mounted with DPX. IHC image of ab205921 staining PD-L1 in PD-L1 Dynamic Range Analyte Control formalin fixed paraffin embedded cell lines (HistoCyte Laboratories), performed on a Leica BOND RX (Polymer Refine kit). The section was pre-treated using heat mediated antigen retrieval with EDTA buffer (pH9, epitope retrieval solution 2) for 30 mins at 98°C. The section was then incubated with ab205921, 5μg/ml working concentration, for 60 mins at room temperature and detected using an HRP conjugated compact polymer system for 8 minutes at room temperature. DAB was used as the chromogen for 10 minutes at room temperature. The section was then counterstained with hematoxylin, blued, dehydrated, cleared and mounted with DPX. Immunohistochemistry (Formalin/PFA-fixed paraffin-embedded sections) - Anti-PD-L1 antibody [28-8] (ab205921)Image from Nakamura S HL et al., PLoS One. 2017;12(10):e0186192 Fig 3.; doi: 10.1371/journal.pone.0186192. 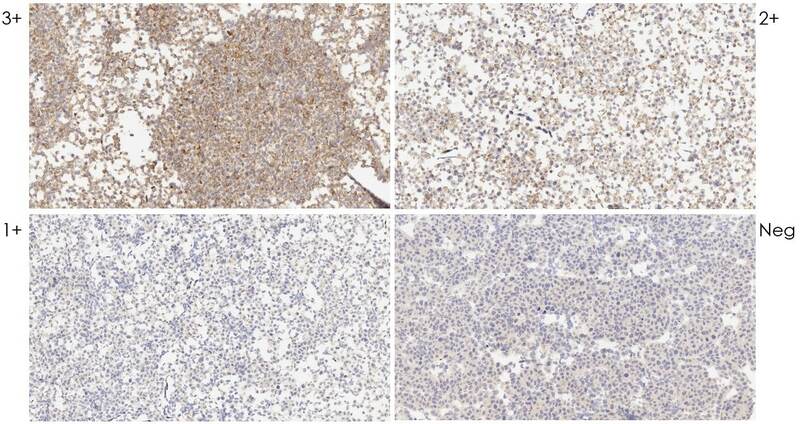 Representative images of PD-L1 expression in human lung adenocarcinoma and squamous cell carcinoma specimens. (A) <1.0%, (B) 1.0–4.9%, (C) 5.0–9.9%, (D) 10.0–49.9%, and (E) ≥50.0% PD-L1-positive cells. Immunohistochemistry (Formalin/PFA-fixed paraffin-embedded sections) analysis of human tonsil tissue labelling PD-L1 with ab205921 at a dilution of 1:400. Heat mediated antigen retrieval was performed using AR9 antigen retrieval solution, and microwave treatment for 15 min at 20% power. Anti-Rabbit/Mouse HRP polymer (PerkinElmer Opal Polymer HRP Ms Plus Rb) was used as secondary antibody. Opal tyramide amplification was performed using Opal 520 fluorophore. Counterstained with DAPI stain. Image scanned with Vectra 3.0 and analyzed via Phenochart software. Immunohistochemical analysis of Human Tonsil tissue with ab205921 at 2 µg/ml. For recommended Immunohistochemistry (IHC) protocol, please refer to the protocol book in the protocol section and/or here (downloadable copy). Strong detection with anti-PD-L1 (ab205921, clone 28-8) TALEN constructs targeting exon4 of human PD-L1, transcript variant 1 (NM_014143.3) and complete knock out (K.O) confirmed by deep sequencing in clone L2-14. Cell surface staining is almost completely eliminated in the L2987 L2-14 K.O. cell line. For recommended Flow Cytometry (Flow Cyt) protocol, please refer to the protocol book in the protocol section and/or here (downloadable copy). Primary ab Dilution 1:100 dilution, Secondary ab Goat Anti-Rabbit IgG H&L (HRP) (ab97051) secondary antibody, 1:20,000 dilution, Blocking and diluting buffer and concentration 5% NFDM/TBST, Lane 1: NCI-H1975 (Human non-small cell lung cancer epithelia), Observed MW 40-60 kDa, Exposure time 3 min. For recommended Western Blot (WB) protocol for endogenous PD-L1 expression, please refer to the protocol book in the protocol section and/or here (downloadable copy). Strong IHC detection with anti-PD-L1 (ab205921, clone 28-8) is seen in human lung adenocarcinoma tumor cell line L2987. PDL1 gene was edited in L2987 cells using TALEN constructs targeting exon4 of human PD-L1, transcript variant 1 (NM_014143.3) and complete knock out (K.O) confirmed by deep sequencing in clone L2-14. IHC detection is completely eliminated in the L2987 L2-14 K.O. cell line. Immunocytochemistry/ Immunofluorescence - Anti-PD-L1 antibody [28-8] (ab205921)This image is courtesy of an Abreview submitted by Dr. Dimitra Kalamida. Paraformaldehyde-fixed, Triton X-100 permeabilized U-87 MG (human glioblastoma-astrocytoma epithelial cell line) cells stained for PD-L1 (red) using ab205921 at 1/200 dilution in ICC/IF, followed by CF568 Donkey anti-rabbit IgG(H+L) secondary antibody at 1/500 dilution. Immunohistochemical staining of PD-L1 in formalin fixed, paraffin embedded human non-squamous non-small cell lung cancer (NSQ-NSCLC) using ab205921 at a dilution of 1/400, incubated for an hour at room temperature. Heat mediated antigen retrieval was carried out in low pH buffer and the sample was blocked with peroxidase blocking buffer for 3 minutes. This image was courteously provided by Dr. Kai Schmitt from the Institute of Pathology, Saarbrücken-Rastpfuhl. 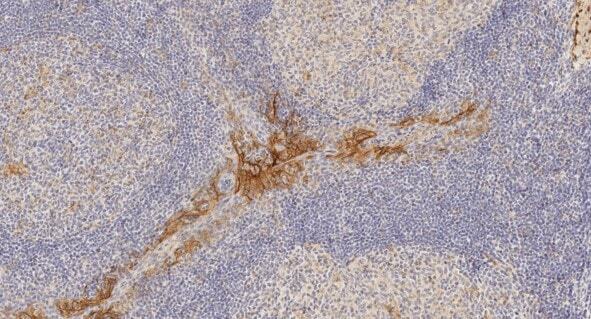 Immunohistochemical analysis of CHO PD-L1 cells with ab205921 at 2 µg/ml. All batches/lots (1,3,4,5,6,7) showed consistent results. 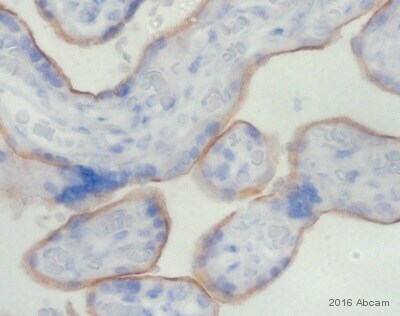 Immunohistochemical analysis of CHO Parental cells with ab205921 at 2 µg/ml. Note absence of PD-L1 expression in CHO parental cells. 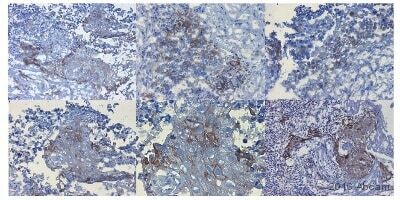 Immunohistochemical analysis of Human Lung NSCLC with ab205921 at 2 µg/ml. All batches/lots (1,3,4,5,6) showed consistent results. Note linear and complete or partial (arrows) PD-L1 staining of tumor cells. Tumor associated immune cells localized over the tumor margin exhibit positive plasma membrane staining (small arrows). Immunohistochemistry (Formalin/PFA-fixed paraffin-embedded sections) analysis of human non-small cell lung cancer tissue labelling PD-L1 with ab205921. Staining can be seen in tumor associated macrophages and tumor cells. For antigen retrival buffer, Universal HIER antigen retrieval reagent (ab208572) was used. 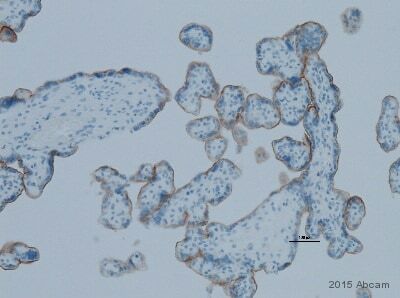 For IHC detection kit, Rabbit specific IHC polymer detection kit HRP/DAB (ab209101) is recommended. Immunohistochemistry (Formalin/PFA-fixed paraffin-embedded sections) analysis of human melanoma tissue labelling PD-L1 with ab205921 on Ventana Ultra. Tumor cells and immune cells show PD-L1 positive plasma membrane staining. Immunohistochemistry (Formalin/PFA-fixed paraffin-embedded sections) analysis of human non-small cell lung cancer tissue labelling PD-L1 with ab205921. Tumor cells and immuno cells localized within the stroma show PD-LA plasma membrane staining. Immunohistochemistry (Formalin/PFA-fixed paraffin-embedded sections) analysis of human melanoma tissue labelling PD-L1 with ab205921. Tumor cells show weak and partial postive PD-L1 expresseion in the plasma membrane. PD-L1 positive tumor associated immunoe cells are also stained. Immunohistochemical analysis of formalin-fixed, paraffin-embedded Human tonsil tissue labeling PD-L1 with ab205921 at 2 µg/ml. Counterstained with Hematoxylin. Immunohistochemical analysis of formalin-fixed, paraffin-embedded Human head and neck squamous cell carcinoma tissue labeling PD-L1 with ab205921 at 2 µg/ml. Counterstained with Hematoxylin. Immunohistochemical analysis of formalin-fixed, paraffin-embedded PD-L1 negative Non-small cell lung carcinoma (NSCLC) tissue with ab205921 at 2 µg/ml. Counterstained with Hematoxylin. Immunohistochemistry (Formalin/PFA-fixed paraffin-embedded sections) - Anti-PD-L1 antibody [28-8] (ab205921)This image is courtesy of an Abreview submitted by Mr. Rudolf Jung. Paraformaldehyde-fixed, paraffin-embedded human placenta tissue stained for PD-L1 using ab205921 at 1/100 dilution in immunohistochemical analysis. Immunohistochemical analysis of formalin-fixed, paraffin-embedded L2987 (Human lung adenocarcinoma cell line with endogenous PD-L1 expression) cells labeling PD-L1 with ab205921 at 2 µg/ml. Counterstained with Hematoxylin. (A and B) Western blots of recombinant PD-L1 protein (Lane 1), cell lysates of CHO-PD-L1 (Lane 3), CHO (Lane 4), ES-2 (Lane 5) and Colo205 (Lane 6) cell lines. In B, anti-PD-L1 (ab205921, clone 28-8) was pre-incubated with purified recombinant PDL1 protein overnight at 4°C. Blank/no sample (Lane2). Lane 2 is blank on purpose. For recommended Western Blot (WB) protocol, please refer to the protocol book in the protocol section and/or here (downloadable copy). Publishing research using ab205921? Please let us know so that we can cite the reference in this datasheet.